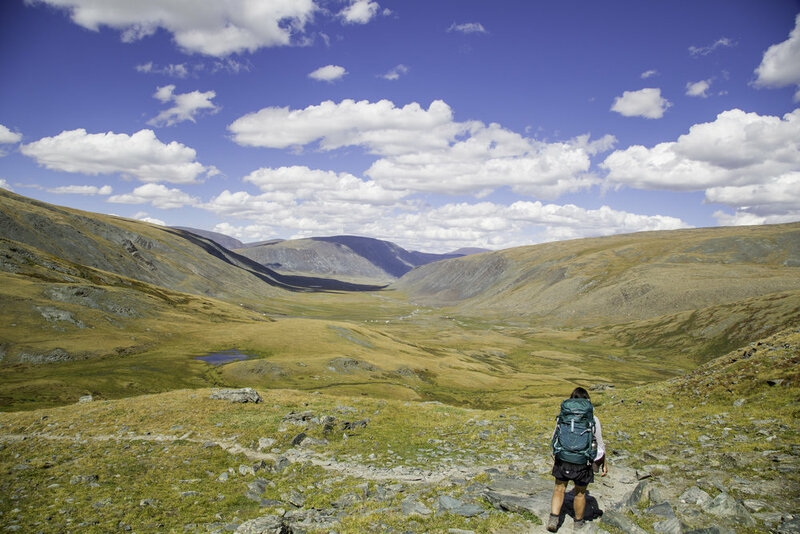 Tavan Bogd National Park, a walkers paradise in Mongolia's northwest. Photo Morgan Gillham. The skies are almost always blue, the landscape is breathtakingly stunning & the wilderness unspoilt - Mongolia is a walker's paradise & a perfect setting for exploration & self-discovery. This is a photo essay follows an 8-day hike through the Tavan Bogd National Park, approximately 1,700 km from Ulaan Baatar (UB), Mongolia’s capital, and home to the Mongolian section of the Altai Mountains. In summer, it is home to many Tuvan and Kazakh nomadic herders who bring their animals to graze in its pastures. 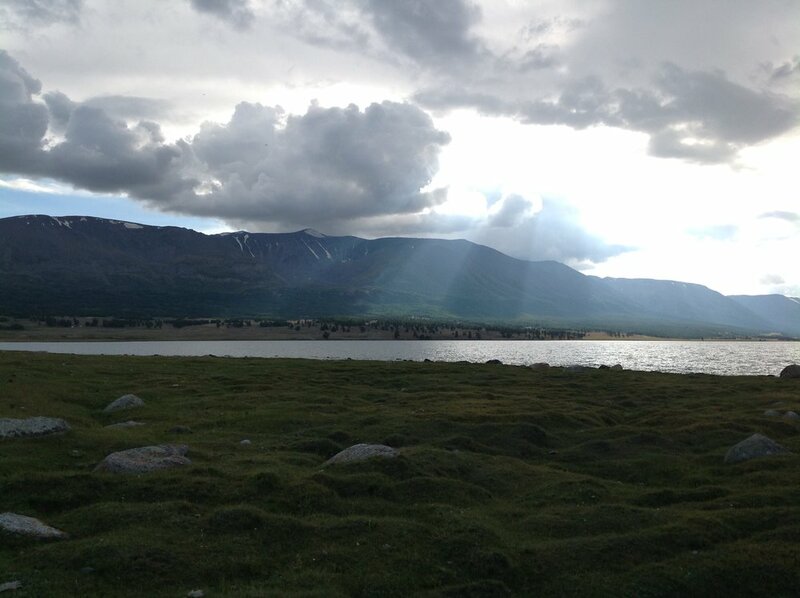 Tavan Bogd is also an idyllic place to spend day after day walking immersed in unspoilt and remote wilderness. Ulgii - the River Khovd and mountains all round this Kazakh town and gateway to the Tavan Bogd National Park. We left Ulgii from the northwest end of the town, past the airport where the bitumen road ends and almost seamlessly veers slightly to the left and onto a dirt track. Most of Mongolia road travel takes place along this colossal network of dirt roads and paths on which you rarely see a post or sign for directions. Leaving Ulgii... no signs or posts in sight! It is an exciting, bumpy ride inside the Russian furgon (like a 4WD combi), we coasted down the side of hills like we were riding rough waves on open seas; bouncing and sliding on the felt seat covers, slowing down often to let the herds of sheep or goats scatter around us, and let us through. On the way to the park we drove through Tsengel district and stopped at our driver’s sister’s place for something to eat. For visitors, food is probably one of the most challenging things about Mongolia, especially those of us who are vegetarian or vegan. On this occasion, in characteristic Mongolian/Kazakh hospitality we were offered a freshly–made stew of goat liver and potatoes. My meat-eating companion braved the pungent dish while I was happy with the homemade bread and black tea. The drive was exciting: long stretches of undulating grassy green hills with yaks, horses, goats and sheep grazing in herds. In the horizon snow-peaked mountains, beside us rushing rivers and creeks whose crossings require skilled 4WD action over uneven, pebbled banks; above us, endless skies with large, greying clouds. Here Khurgon Lake just south of Khoton Lake can be seen in the distance...almost there. Five and a half hours after leaving Ulgii we arrived at this bridge at the southern most end of Khoton Lake, the start of our hike. Khoton Lake - the start of our hike is at the southern end of the lake. Our walk starts here with a bridge crossing over Khoton Lake (above) at about 2,000 metres above sea level. We said good bye to our driver and double checked our pick up from the northern entry into the park 8 days later. After sitting in the van for half the day we walked energetically, the lake on our right, China not far on our left and all around scattered larch trees and remaining trunks, hacked, evidence of significant clearing, probably for firewood. Not long after crossing we said hello to a group of Russian mountain bikers who had ridden around the 50 square kilometres of Khoton Lake; the lake is quite popular with Russian tourists who come to camp and fish in its plentiful waters. After about 8 km we found a patch of grass free of twigs and rocks from where we could set up camp. As the sun set on this first day of our 8-day hike through the Tavan Bogd National Park this pack of horses walked past us in the distance...a great last view of the day on this already amazing journey. Check out or Instagram page for more great photos!